The clash over President Moon Jae-in’s civil affairs secretary and misconduct by Cheong Wa Dae officials appears set to intensify. According to a local daily, Civil Affairs Secretary Cho Kuk effectively ruled out resigning from his post, saying, “all criticism must be borne, (I) will return to the school after carrying out my tasks,” in a text message. Cho is a professor of law at Seoul National University. He took the post during a sabbatical year. The heat on Cho has been rising in recent weeks, following a series of misconduct by Cheong Wa Dae staff. In early November, an official with the Presidential Security Service was taken into custody for assaulting a civilian while intoxicated. The incident was followed by Secretary of Protocol Kim Jong-cheon driving under the influence of alcohol and the revelation that an official with the special inspection team attempted to gain information concerning a police investigation. In addition, it has been alleged that members of the inspection team played golf during work hours. Following the allegations, officials in the special inspection team were sent back to their respective organizations and Cho requested police and the prosecutors’ office investigate concerned individuals. The opposition bloc, led by the main opposition Liberty Korea Party, has accused Cho of incompetence, calling for his removal from the office. Moon, however, has chosen to throw his weight behind the besieged civil affairs secretary. According to Cheong Wa Dae spokesperson Kim Eui-kyeom, Moon ordered Cho to strengthen measures for maintaining discipline among civil servants and to draw up plans for reforming the special inspection team. Kim also quoted Moon as saying “the people will make the right assessment on this case once the results of the audit conducted by the Supreme Prosecutors’ Office is out,” when he gave the orders immediately upon his return to Korea on Tuesday. Kim also said that Moon considers actions taken by Cho to have been appropriate, and that there are no changes regarding Cho. Moon’s decision has further riled the opposition. 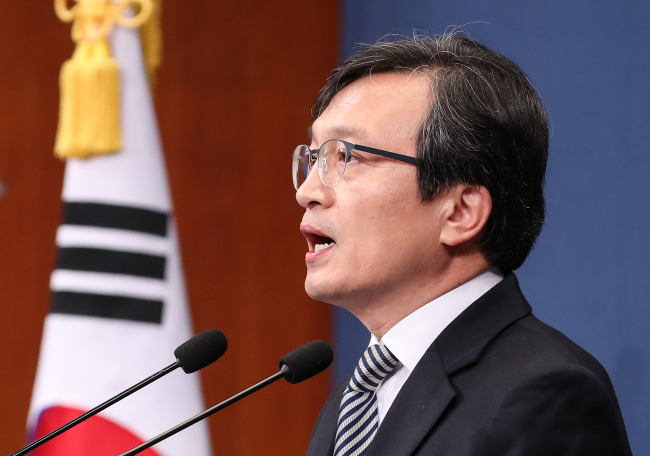 “It is not a matter for the president to be obstinate about when all the opposition parties say Cho is responsible,” Rep. Kim Sung-tae, Liberty Korea Party floor leader, said Thursday. Kim went on to question Moon’s decision, saying Cho should be held responsible rather than being tasked with resolving related matters. “To quickly draw up improvement plans, Cho must first be held responsible,” Kim said.